A despacho is a prayer bundle or offering. For hundreds of years, the Laika (high shamans or wisdomkeepers of the Q’ero lineage of Peru) have used the despacho ceremony for a wide variety of occasions – births, deaths, as an expression of gratitude, to heal physical and emotional ailments, to restore balance and harmony, or when there is a specific request of the spirit world. Similar to a mandala or sacred creation, the despacho holds symbolic elements and the prayers of the participants. As the elements are added to the despacho, the vibration of the participants and the room raises. The despacho becomes a living prayer that brings energy shifts and healing. Prior to the despacho ceremony, a variety of ingredients (biodegradable whenever possible) are gathered as offerings. Tangible offerings enhance the feelings and intentions of our prayers and are of great importance when praying for a community or humanity. Suggested offerings include sugar and sweets, corn and/or other grains, coca leaves (or whatever herbs or small leaves are readily available), flowers, incense, paper (or “play”) money, salt, feathers, beans, colorful yarn, and any other item that is significant to the occasion. The elements are less important than the intent. You will also need a large piece of paper, or a sizeable leaf, to place the offerings on and later, wrap them with. Here are the steps to create your own despacho. The ceremony can be as simple and short, or intricate and lengthy as desired. As with any ritual, the despacho begins by opening sacred space. Then the offerings are selected one by one, a prayer is said over each, and the prayer is gently blown into the offering before it is placed on the wrapping. The offerings can be arranged however feels right. (The experienced shaman will likely follow a specific pattern, but again, the intent is more important than the pattern). Humility and gratitude and an open heart are important throughout the ceremony, and will ensure that you experience more grace in your life by becoming a better vessel for grace. Once completed, the despacho is carefully wrapped and secured with a ribbon or string. 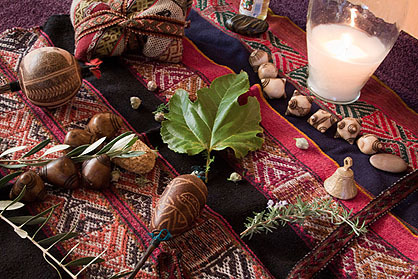 The bundle can be ceremonially buried (for slow, steady results), burned (for quicker transformation) or fed to running waters, thus conveying the gifts to Spirit. If the despacho is burned, someone should stay with the ﬁre until the embers are cold, if at all possible. Do not put water on the ﬁre. Ashes created in this sacred ﬁre should be buried in the earth at a later time. Remember to close sacred space once the ceremony is over.